Jonah Hill and Channing Tatum go back undercover as students in this sequel to a reboot of a 20 year old teencentric cop drama. "Just do the same thing as last time," Deputy Chief. Hardy (Nick Offerman) tells Officers Schmidt (Hill) and Jenko (Tatum). Only this time, they're going to college. The generic sounding Metro City University to be exact. 22 Jump Street has the same set up as 21 Jump Street. Jenko and Schmidt investigate a new drug infiltrating the student body. Called WhyPhy (a mash up of "Work Hard, Play Hard") and coming with the requisite comedic side effects, the drug source needs to be stopped before it spreads to other campuses. Just like the last film. That the bromantic duo does even less police work this time around is only part of the joke. They realize they are in a terrible police movie sequel, but they don't realize they are terrible police officers. A shining example of their incompetence comes when the two are informed of a key suspect's arrest via TV report. There is also a criminal mastermind on the loose, The Ghost (played by the always excellent Peter Stormare, Pain & Gain). Schmidt and Jenko have no idea what illegal trade he actually participates in. 22 Jump Street is completely self aware film. It knows it really has no artistic or cultural merit, yet it sets out to have fun anyway. And it is fun. The cast winks at the audience nearly every step of the way, and nearly every scene is dripping with sarcasm, irony and parody. Directors Phil Lord and Christopher Miller (who also directed this year's considerably more kid friendly Lego Movie), keep the film moving with a nonstop manic energy, throughout it's slightly overlong runtime. Highlights include a double box of two characters conflicting experience on a WhyPhy trip, and an extended credits sequence, of even more proposed Jump Street sequels. Tatum and Hill have great comedic energy, and they crib from classic comedy double acts, right down the tall vs. short, skinny vs. fat physical comedy pairing. Much is made of their partnership being more like a "romance," including a trip to the school psychologist for couple's counseling. 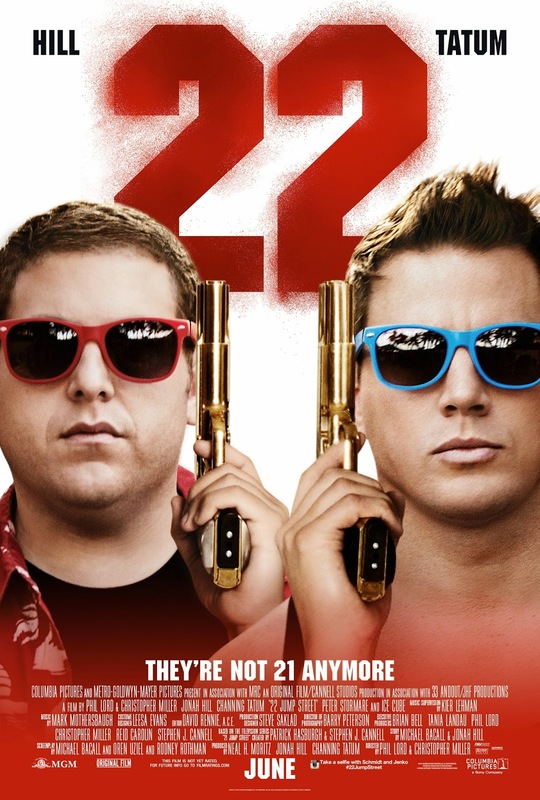 22 Jump Street was written by Michael Bacall, Oren Uziel and Rodney Rothman. Ice Cube costars as Captain Dickson, and he crews the scenery every time he is on screen, sending up both the Angry Captain (tm) stereotype, and seemingly his own persona as an angry rapper. Wyatt Russel, Amber Stevens and Jillian Bell round out the cast. It's fun. It's silly. It's crude. 22 Jump Street, like it's predecessor, has no reason to exist but is enjoyable anyhow. In some ways 22 Jump Street is more clever than the original, but to get of the the in jokes, it's necessary to have seen the "original" movie. The filmmakers wouldn't have it any other way.